Upon arrival at Southwest Florida International Airport (RSW - Ft Myers, Fl), collect all your baggage on the lower level first. Only after collecting all your luggage, call Pine Island Taxi to have your vehicle quickly dispatched from the holding area to the terminal. You will be asked which of the six doors you will be exiting. Please locate your driver to the right of the door your exiting in 3-5 minutes. Look for a vehicle with PINE ISLAND TAXI. 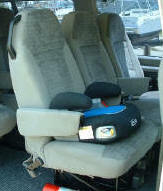 Florida Law requires your child be in a car seat. Parents need to bring appropriate car seating for children. We do carry booster seats, please reserve the number of boosters required. We can not leave the curb unless all parties are secure. Once we leave RSW you're on Island Time (it doesn't get any better - Relax & Enjoy); the next hour or so is yours to START WINDING DOWN. If you have Fax Groceries at Publix it's a quick stop, in about 15 minutes your order is loaded up for the final 25 minute ride to the dock. Total time runs about 1 1/2 -2 hours, Airport to Pine Island with stops and traffic. Cape Coral about 40 min. Will a trailer be needed to accommodate your luggage? Groups of 8 or more with luggage, a trailer is usually required. Larger parties we need to know how much luggage and groceries you intend to bring on arrival to assess if a van is adequate or more storage is required. Additional fee for trailer. Pack Light! Smaller uniform bags are most convenient. The HUGE/OVER SIZED/OVER WEIGHT bags are difficult for everyone. Your luggage has to be loaded, unloaded, packed, stored and toted in and out of tight spots and numerous vehicles during your stay. Please be considerate. Check, but most places you stay have laundry capabilities.